Hope is a city in Arkansas. 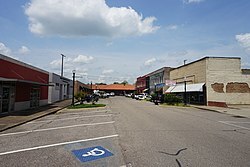 It is the birthplace of former Arkansas governors Bill Clinton, who was later U.S. President, and Mike Huckabee, who had an unsuccessful run for the Republican nominee in the 2008 United States Presidential election. According to the 2010 United States Census its population is 10,095. ↑ "Hope, AR Population - Census 2010 and 2000 Interactive Map, Demographics, Statistics, Quick Facts". CensusViewer. Retrieved 16 January 2013. This page was last changed on 6 November 2018, at 20:16.